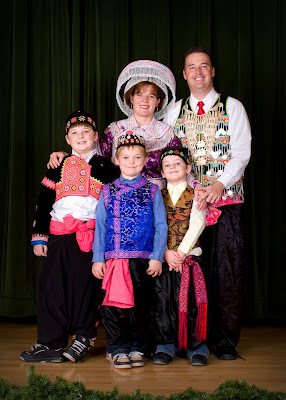 The Christophersons: Happy Hmong New Year! Reagan Elementary celebrated Hmong New Year yesterday. One of our teachers has a collection of authentic Hmong dress and much of the staff dressed up for the occassion. We had a huge Hmong potluck and great assemblies. Kari came over in the morning to take a picture with me and the boys. It was a fun day to celebrate an amazing culture! the costumes are great - where did you get them all? did any ladies wear a hat like that for the duration of the school day? i think my favorite part of the picture is the line of shoes across the bottom. it looks like you posed everyone's feet just right as if you planned especially to to a panoramic banner on your blog.